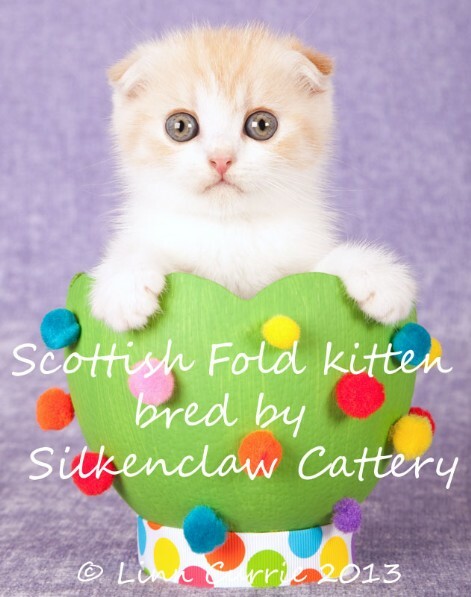 A medium sized breed, the Scottish Fold has a rounded head with full cheeks. The muzzle should not be snub like a Persian or Exotic, but have well rounded whisker pads. The eyes should be large, set well apart and round, giving the cat a sweet expression. Chin is firm. The ears fold forward and then downwards. A smaller ear is desirable, and preferably folded tightly on the head like a cap rather a loose large ear. 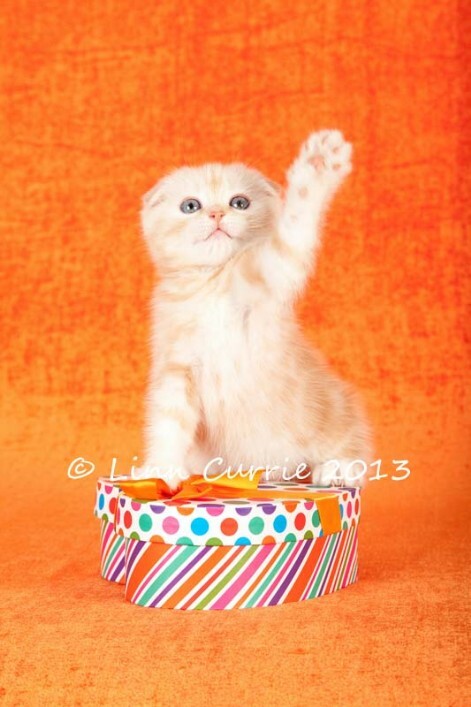 Scottish Fold kittens are born with normal ears. It is not until they are approximately a month old that the ears begin to fold. Or in the case of variants, not fold at all. The ears do not remain stable though, and continue to lift and fold again for some time. Folds vary from one degree to the coveted triple degree fold (forming a tight cap on the head). The folding of the ears are at times affecting by climate, pregnancy, females going into season and so on. Many sources claim that wax build up is common in this breed, however this is definitely not the case in my experience. It is far more prevalent in the Selkirk Rex as an example; though admittedly reduced once over their first year. The body is medium sized and of the same level from shoulder to hindquarters. An appearance of an overall well rounded cat is required. Boning is medium and males are proportionately larger than females. The tail should be medium in length and in proportion to the body. The tail must taper and the more flexible, the better. The coat is short, dense, plush, soft and medium-short. Standing away from the body because of its density, rather than flat and close lying. The texture of the coat may vary with different colours, climate and seasonal changes. All colours and patterns are acceptable, though eye colour must match the coat colour and pattern. Due to the outcross breeds used, grooming is necessary. A weekly brush will be more than sufficient, though this may have to be stepped up during change of season. Eyes may get mucky on the infrequent occasion and need to be kept clean.